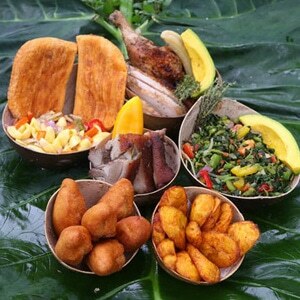 Designed exclusively by native Jamaicans and owners of Know Jamaica Tours, Javia and Marva Shaw have put together a very special tour to make your “Yaad Food” and cultural tour experience even more personalized and filled with pleasure. Although much smaller than Dunns River Falls, Konoko Falls is just as picturesque, if not more, and is so beautiful it will have you wondering if you’ve drifted off into a wonderland! I’m sure your friends and family would be bummed if you didn’t take back some Jamaican goodies for them, right? This is your opportunity to grab some souvenirs! Of course after all this excitement you more than likely feel hungry and want to devour some real Jamaican Jerk right? We have you covered! Please be advised that the quoted price is inclusive of lunch, entry and your roundtrip tour.